One of our reader was complaining about WordPress Academic Journal plugins. As WordPress highest number of user compared to any web software, WordPress is great for initial works. However, WordPress was never developed thinking about so large usage. Although WordPress with PostgreSQL database can run, it is not exactly practical on production environment. Approaches Exist For Modern Academic Journal With Git Backend and Jekyll, OctoPress as Front-end Instead of PHP, MySQL in the Era of IoT. We will tend to say that, if WordPress is not suitable as Academic Journal Backend, Drupal is proven good and modern. But the basic matter is that, why waste so much Computing Power for the ultimate result as HTML? Rackspace Cloud Blog uses Akamai’s CDN to host their whole blog with OctoPress. Jekyll and OctoPress is more easy than a PHP and MySQL backend, is not it? GitHub or Gitlab has WYSIWYG editors too. Basically we need a nice workflow and practical front end. ReScience did that. Jekyll and OctoPress has quite large user base. We need some good working HTML output to start working on a scaffolding. Think carefully, using self hosted GitLab with OctoPress with CDN is most practical idea. It is money saving too. CDN’s all server’s will not fail on load. If you have no money, then use Free Cloud Storage like Dropbox to host Octopress or Jekyll or just GitHub. Only problem is DOI, which is not free of cost. ISSN is free. There are plugins exist to convert WordPress to Jekyll. With that one will need pandoc (a universal document converter). For pandoc, pandoc-crossref filter will be needed. We suggest not to change the original idea of ReScience or PUSH except self hosting. 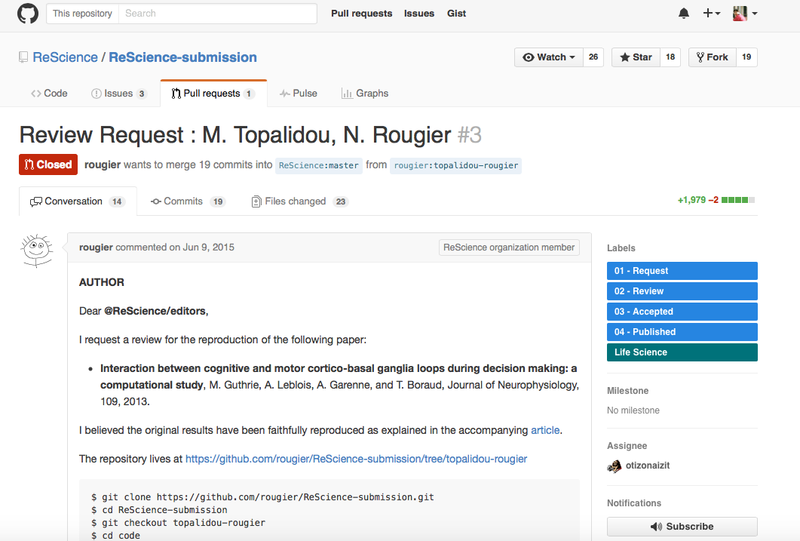 What they does, they use GitHub’s server both for Submission-Editing process and Publication of Journal. We are suggesting to install Gitlab on your server for the Submission-Editing process and OctoPress or Jekyll for the content management system. Those who are not aware, basically OctoPress or Jekyll needs near nothing on server – that is why we are talking about CDN. Your own computer will process it. If you dislike WWW subdomain on CDN, obviously you can use your server. +--rescience.github.io : Jekyll or OctoPrees FrontEnd. Downloading the whole project will work fine. Users of Open Journal System, how much “open” that is questionable. Most importantly, “Free Software” is desired over “Open Source”, hence Free Journal System is better word over Open Journal System. In other words – who will make PUSH or ReScience further better, should make their source code available on GitHub. The softwares could be scripted like we did for OpenShift OctoPress. For the writers one script, for the editors one script and for the administrator one script. It will also force to use GNU/Linux or OS X over Microsoft Windows, which is actually do another good. For higher security, GPG can be used to sign. With KeyBase.io like Service, identification will be 100% assured. This Article Has Been Shared 309 Times! The Shut Down of Google Code Project Giving More Opportunity To The Rise of PaaS – Self Hosted Free Solution For The Developers With More Control. Here is How To Deploy OctoPress on OpenStack Swift, Example Given With HP Helion Cloud With Only Python Swift Client & a Custom Shebang Script. VMware lost a major customer PayPal, who decided to go with the famous Open Source cloud computing platform OpenStack. PayPal notably drafted HSTS. You Should Understand Why OpenStack Based Cloud Server i.e. a Web hosting or Public Cloud Service Provider is Superior Over a Closed Sourced Provider. Multicloud means, simultaneously using multiple cloud computing services either of same model or different model – IaaS with SaaS or IaaS with PaaS. Cite this article as: Abhishek Ghosh, "Modern Academic Journal With Git Backend," in The Customize Windows, May 21, 2016, April 23, 2019, https://thecustomizewindows.com/2016/05/modern-academic-journal-with-git-backend/.